My name is Áine Keane. I am 19 years old. I’m a student at Presentation Secondary School in Mitchelstown, Co. Cork. I am currently doing the Leaving Cert (2017). 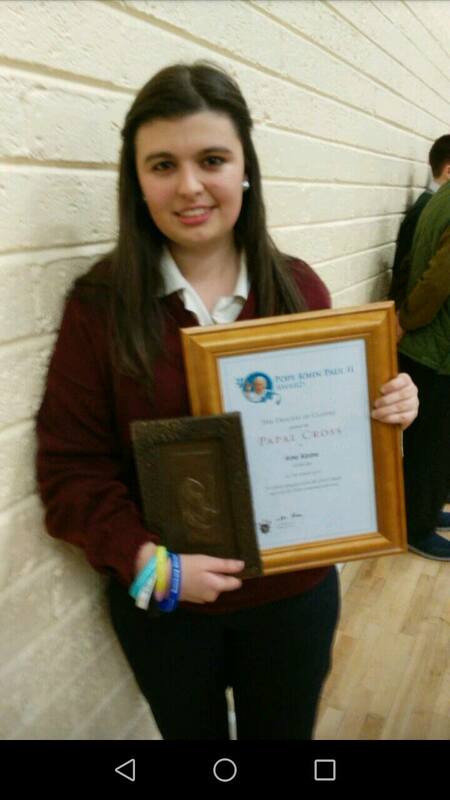 I took part in the Pope John Paul II Awards when I was in Transition year in 2015. (Note: The Pope John Paul II Award recognises young people’s commitment to faith and community, making young people visible in their church, community & society. See here: https://thepopejohnpauliiaward.com/). To receive the Pope John Paul II Award you have to help out with the community and parish. For the community I helped out with the Cope Foundation in Mitchelstown. Cope Foundation is about helping adults with special needs. I went there every Friday and helped them walk out to the bus and put their seat belts on and we would head off in the bus for a day out. I am also a junior Girl Guide leader and this also helped for the Pope John Paul II Award as being a Girl Guide is all about helping the community. I also helped out with the Mitchelstown Carmelite Lourdes Group when they went on pilgrimage to Lourdes. I was a volunteer helper, helping with the sick people of our community in Lourdes. We helped to push them in the wheelchairs to and from the Grotto. For the parish side of the John Paul II Award, I volunteered to read the readings and Prayer of the Faithful at Mass. Also, I helped the Net Ministeries team with the choir for the Youth Mass on a Sunday evening. [Note: Net Ministeries is an organisation that works in schools and Parishes encouraging young people to love Jesus and embrace the life of the Church. Recently, Net Ministeries had an active presence in Mitchelstown parish]. I’m also a member of a local Youth 2000 prayer group that meets every Tuesday evening at 8pm in Mitchelsown town hall for prayer and a chat. Due to being a member of Youth 2000, I go to the major retreats and regional retreats, where we pray and make lot of friendships and hear testimonies and workshops [see www.youth2000.ie]. Whenever there was a school Mass, I’d volunteer to take part in the Prayer of the Faithful. I also visited Medjugorje. This year will be my 3rd time going there. I climbed Apparition Hill and I also climbed Cross Mountain barefoot up to the 12th station but then wore my shoes for the last two stations. I helped out with a fundraiser when I was in Transition Year in school (2014-2015). We baked and had a coffee morning and we raised money for breast cancer awareness. In October in 5th year (2015) I received the Pope John Paul II Gold Award and I decided to carry on and do the Papal Cross Award. For this award, the weekly work was longer but it was so enjoyable. In October in 6th year (2016) I then received the Papal Cross Award. Every school year we have an awards ceremony and last week I received my second Nano Nagle Award which is for participating in the Pope John Paul II awards and for helping with the parish and community. [Note: The Nano Nagle Award is awarded to a person of exemplary community service, nominated by a Presentation Sister or a teacher in a Presentation school]. I absolutely loved it. 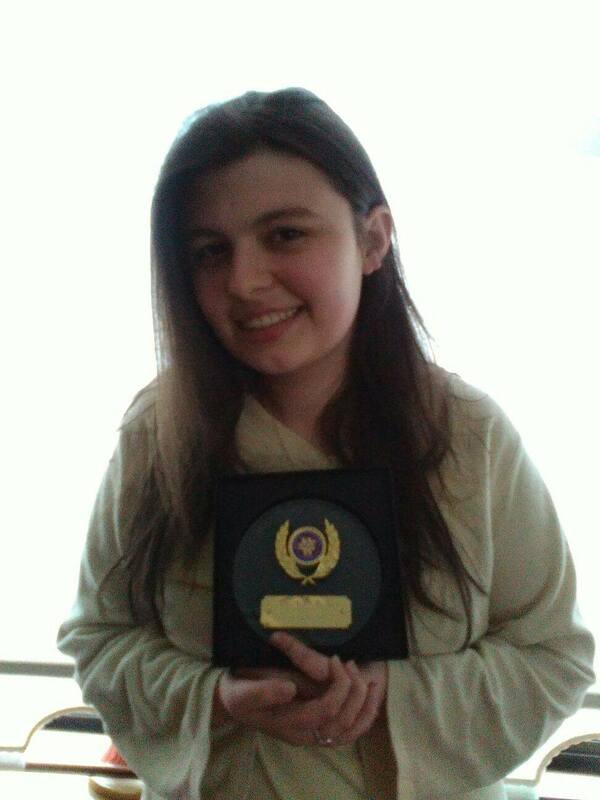 From this award my self confidence and faith grew stronger. I was asked by the Carmelite Lourdes Group to give a speech about my experience in Lourdes. In the Summer, I love to help with the Faith Camps for children. So far, I’ve helped with faith camps in Mitchelstown, Abbeyfeale and Ardmore. [See here: http://cloynediocese.ie/faith-camps/]. Upto a few years ago there would be no way say a prayer from the ambo of a church! I definitely recommend participating in the Pope John Paul II Awards as it makes young people more aware of their community and parish needs. The Pope John Paul II awards brought me back to the faith. It was the start of my faith journey. 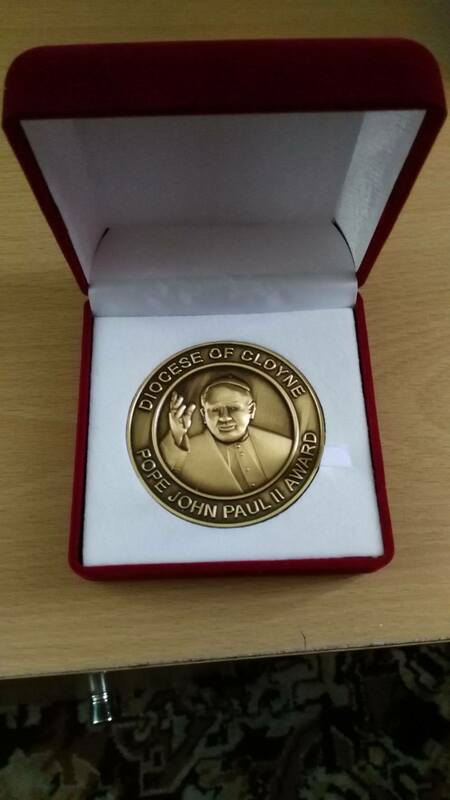 For more information on how your parish or school may become involved in the Pope John Paul II Award, please contact the Cloyne Diocesan Youth Service team, details here.